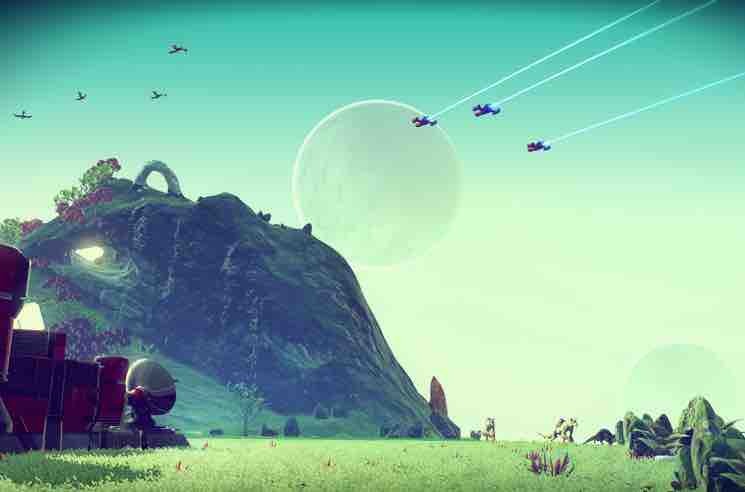 No Man's Sky was supposed to be the game of the summer. The rabidly anticipated outer-space sandbox from British indie Hello Games promised ambitions so sky-high that the sci-fi survival game would soar past the corporate competition and into instant icon status. That was early August. By month's end, the internet had turned on what turned out to be mostly a Myst-like exploration game. Angry players even began demanding their money back, because they felt ripped off by the hype and features that never made it into the final product. Admittedly, what VG247.com has declared "the most divisive game of 2016, if not the entire decade" is not as good as people hoped, but it's also not as bad as people claim. Rather, the selling point of No Man's Sky all along has been its size, which, for all intents and purposes, is infinite. There are literally, or rather theoretically, 18.4 quintillion planets in the game's simulation of the universe. When I say theoretically, that's because these planets don't really exist until you discover them — kind of a Schrödinger's Cat thing. You see, in order to replicate the universe, the game relies on procedural generation. When a deterministic algorithm designs your game, it's not necessarily as interesting as when a person does it, which is not to decry the approach altogether. Basically it means that your game is designed while you play it, with the creation rules determined by mathematical equations and randomized rule sets. Hello Games was actually joining a lineage of procedurally generated games that began in the 1980s, with games like Rogue (which defined the genre known as "Roguelike") when there was little space to store big worlds. The most famous example prior to No Man's Sky was Elder Scrolls II: Daggerfall, which came out back in 1996. In order for Bethesda to craft a game that was, relatively speaking, almost as big as the British Isles, they relied on procedural generation. However, the studio downsized for the next few traditionally designed games, dropping from 16,000 sq km and 750,000 non-player characters to 24 sq km and 2700 NPCs on Morrowind. (Oblivion and Skyrim were 57 and 27 sq km respectively, and about 1000 NPCs each.) Moe recently, Borderlands used procedural generation for aspects like more varied loot, but few have gone on all in like No Man's Sky. The hook here is that the game's environments are procedurally generated, so while you will die a lot, each time you'll wake up in what amounts to a new small town with new townsfolk. However, the game is still in alpha stage — you can access it via Xbox Live Preview and Steam Early Access — and does not yet feature cut scenes, persistent characters and other narrative content that will presumably be in the final version. Which brings us back to No Man's Sky and its own limited story and gameplay. There is combat, against both aliens and robotic "Sentinels," as well as resource mining and management and even a vague plotline about following the mysterious Atlas's directions toward the centre of the galaxy. But the real problem is actually the game's selling point — its size. The reason why humans have never gone beyond the moon is because it takes too long to get anywhere. That real-world problem is replicated here, with long stretches of nothing much happening, whether you're exploring a planet on foot or trying to discover a new one on the other side of that distant star over there. What exists now is undeniably beautiful and can be meditative if you let it. "This maybe isn't the game you imagined from those trailers," Murray blogged as the backlash built. "It's a weird game, it's a niche game and it's a very, very chill game." It's also a very very repetitive game. But it is a game, which means it can be upgraded with DLC much as Destiny could. Hello Games has said "No matter what feedback you gave us, you have been heard and we are listening carefully" and that "this is a labour of love for us, and it's just the beginning." They've promised free updates that will include freighters and building bases among other enhancements. Ultimately, a math-made universe can only take you so far, but No Man's Sky can be saved with a little more intelligent design.